Model S 90D owners claim their car hit their house twice due to defective self-driving sensors. February 17, 2019 — A Tesla Autopark and Summon lawsuit alleges a 2016 Tesla Model S 90D crashed into a home on two occasions because the features are defective. Plaintiffs Bikan Octain and Daljit Octain say they paid $111,450 to buy a 2016 Tesla Model S 90D that included $3,000 for "Full Self-Driving Capability" that included Autopark and Summon. Autopark is advertised as a feature to help a driver automatically parallel park or perpendicular park. 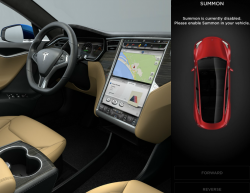 The Summon feature is marketed as allowing a driver to move the car in and out of parking spaces from outside the car by using a key or mobile phone app. According to the lawsuit, the Model S is equipped with defective sensors and software that led to the car hitting the home, allegedly causing damage to the car and home. In May 2018 while using the Tesla Summon and Autopark features, the Model S allegedly crashed into the home the first time. The plaintiffs took the car to a Tesla service center that allegedly took months to perform the work. The Model S allegedly hit the home a second time in August 2018 while the Summon and Autopark features were activated. The lawsuit alleges the front-end of the car was already inside the garage when the Model S traveled left and drove itself into the side of the garage. The plaintiffs say they contacted Tesla within 24 hours of the second incident to discuss the self-driving capabilities of the Model S. The automaker allegedly inspected the car but refused to perform repairs, advising the plaintiffs they should no longer use the Autopark and Summon features. Days later Tesla allegedly told the plaintiffs their Model S would no longer be serviced. According to the lawsuit, the plaintiffs wouldn't have been driving the Model S if Tesla would have warned them about the Autopark and Summon features. Making matters worse, the plaintiffs allegedly demanded arbitration but Tesla refused to participate in the process. The plaintiffs say Tesla should pay $600,000 in damages for selling them a defective Model S 90D. The Tesla Autopark and Summon lawsuit was filed in the Circuit Court of Fairfax County Virginia - Bikan Octain and Daljit Octain, v. Tesla, Inc, et al. The plaintiffs are represented by Silver & Brown. CarComplaints.com has complaints filed by Tesla owners.